15.6" diagonal touch-screen display for easy, intuitive use. Lets you run programs at the touch of a finger, taking advantage of Windows® 8's touch-screen support. Wireless-N (802.11n) for high-performance, cable-free networking. Lets you access wireless networks to share files, surf the Web and exchange email. Fully compatible with 802.11b/g as well. Wired networking is supported, too. Memory card reader for fast, easy file transfers. Transfer your digital photos, music and other files from 8 types of memory cards. 2 USB 3.0 ports for ultra-fast data transfers. Up to 10 times faster than USB 2.0, yet fully compatible with USB 2.0 devices. Built-in HD webcam and microphone let you keep in touch with others via video and voice messaging. Supports video resolutions up to 720p. Integrated numeric keypad speeds data entry and calculations. Microsoft® Windows® 8. The very latest version of Windows. Greener choice — complies with EPA's Energy Star® standards. 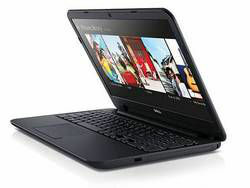 Dell Inspiron 15 Touch Laptop: Big on features, not on price. Experience hands-on interactivity with touch functionality. The things you do with a mouse and keyboard are more intuitive with touch. Access your email and favorite websites, view and edit your media, and switch between apps, all with the touch of your fingers on the screen.